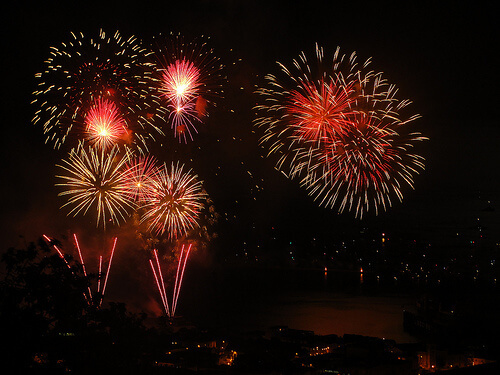 Perhaps the most notable celebration in Chile on New Year’s Eve is the massive fireworks show in Valparaiso. Typically the weather is beautiful (it is summer time in the southern hemisphere) and watching the fireworks over the water offers a great visual treat. 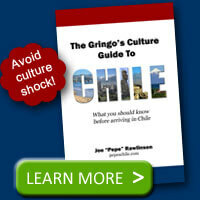 However, there are several other Chilean New Year’s traditions that people do to bring in a prosperous new year. Put money in your shoes (a paper banknote or peso bill might be more comfortable than metal coins). This tradition will bring you financial prosperity next year. I’m not sure if there is a correlation of how much money you put in your shoes and how much you make in the New Year, but anything is worth a try! Chile is famous for its agriculture and wine production. Enjoy 12 Chilean grapes to predict how the coming 12 months will fare for you. Is each grape sweet or sour? So shall be the associated month next year. If you spend any amount of time in Chile, you’ll eat various bean dishes. So even if you’re sick of beans, save some space for your New Year’s tradition. As you ring in the new year, eat a few bites of lentils to guarantee a financially prosperous year ahead. Are you hoping to travel in the coming year? To ensure that happens, go for a stroll around the block with your suitcase to celebrate the New Year! This tradition brings a great romantic future and a well-stocked wardrobe of clothes for the New Year. 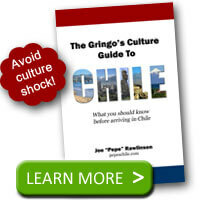 What is your favorite Chilean New Year’s tradition? Thanks for reminding me of these traditions! I was in Chile last year for New Year’s and we, single ladies, also put rings in our champagne glasses for love in the new year. My other favorite was to write down what we wanted to leave behind from the current year on one piece of paper and then what we wished for in the new year on another. At midnight we burned these papers. Marla – thanks for sharing these two additional traditions! Eating lentils (and beans) as luck for the new year: intersting that we find this tradition in Chile. It transcends so many cultures…It comes from the fact that legumes and beans get larger when they are cooked, therefore, we eat them in hopes that our good luck and bank accounts increase in the new year. This is an ancient custom and certainly can be traced to medieval Jewish traditions, but forms of it are found in many places of the world, including the Southern part of the EEUU where one eats black eyed peas for a new year filled with prosperity.